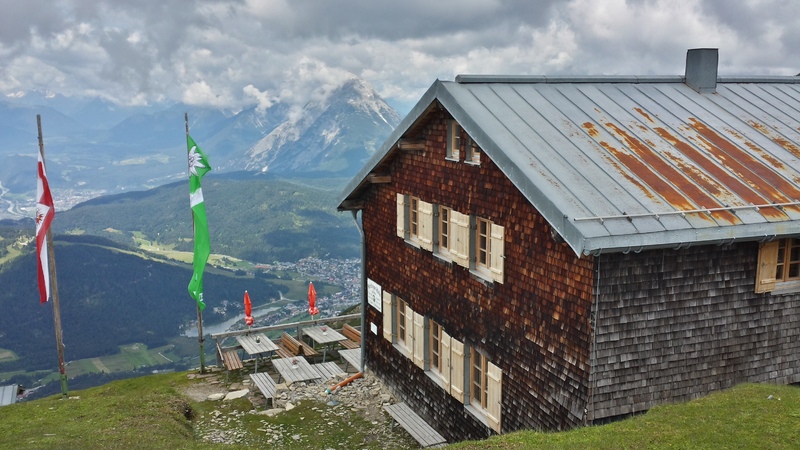 My absolute favorite (shorter) hike around the Seefeld region is the hike to the Nördlinger Hütte. 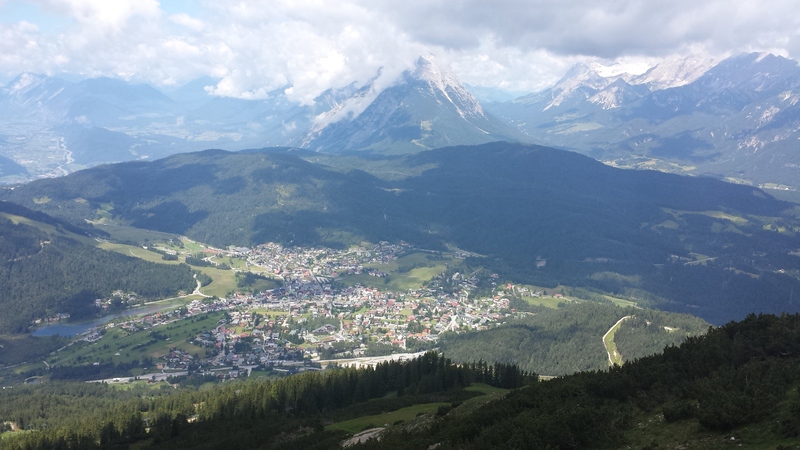 From Seefeld the hike takes a couple hours, if you take the cable car to the Rosshütte then the gondola to the Härmelekopf you can hike to the Nördlinger Hütte in about 45 minutes. You will see this sign as soon as you leave the fenced area from the Härmelekopf. This hike is beautiful and it’s suitable for dogs too, we have seen kids on the trail many times but if they are not experienced hikers I wouldn’t recommend it. You will have panoramic views of mountains and the Inn Valley all the way to Telfs! Some areas of the trail are quite small and some areas are steep with metal ropes to help you up. You should wear hiking boots and if you’re not an experienced hiker bring hiking poles. 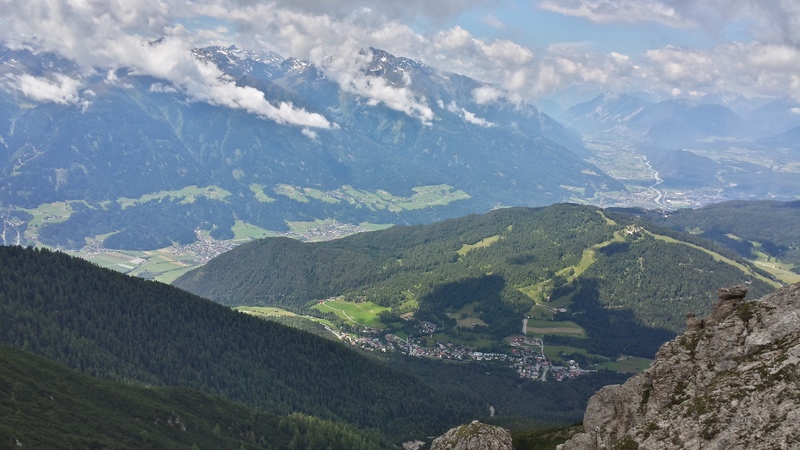 The village in the picture above is Seefeld, the lake is the Seefeldersee (or the Wildsee). In the picture below you can see Auland and Telfs. 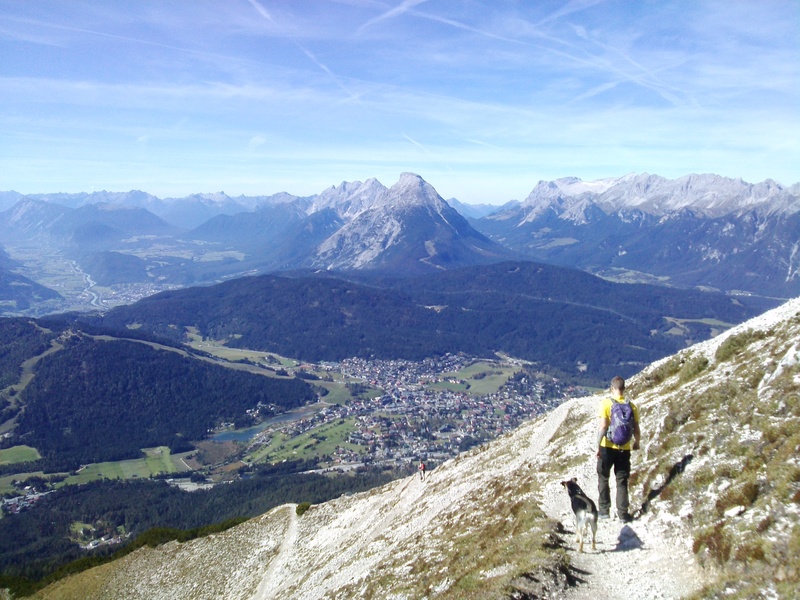 The picture below shows the view on the way back to the Härmelekopf but it’s the only picture I could find showing the trail. For the most part this is about the size of the trail, it narrows in some areas and is steeper in others but nothing too outrageous. 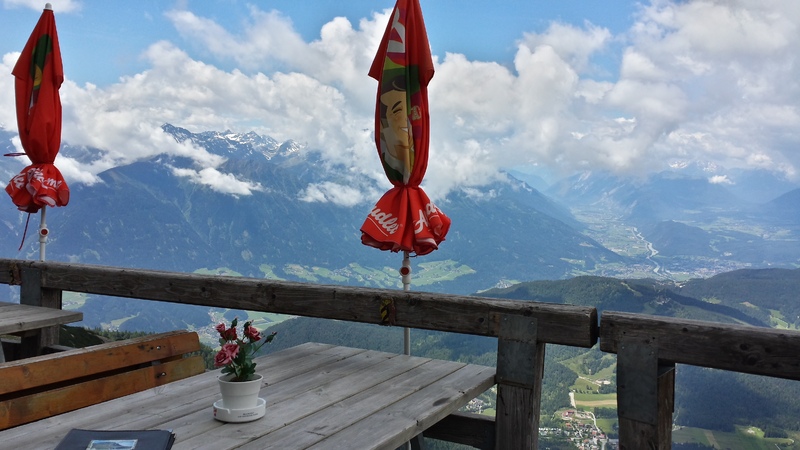 Once you get the the cabin you can sit outside and have some Tyrolean cuisine or a Radler (beer mixed with sprite) and enjoy the view. When you are done having a snack you should definitely take a minute to walk up the hill behind the cabin, your jaw will drop! 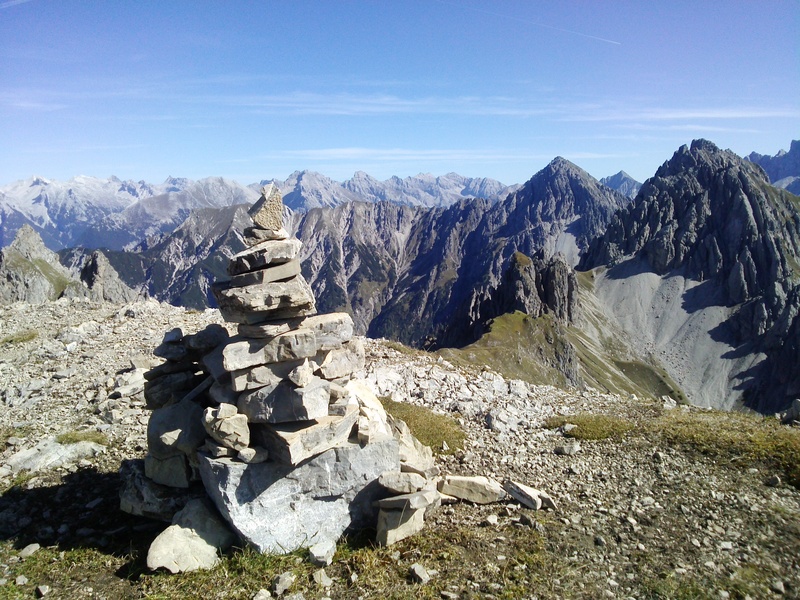 The trail you see in the below picture is one we took on a different day, see my post about the Freiungen Höhenweg! A view of the cabin and the Reitherspitze (top of the mountain behind the cabin) and my dog, Joey. Looking the other direction you also have a gorgeous view! It’s so panoramic up here it’s unbelievable! There are a few cairns on top of the hill, be sure to add a rock to the top! 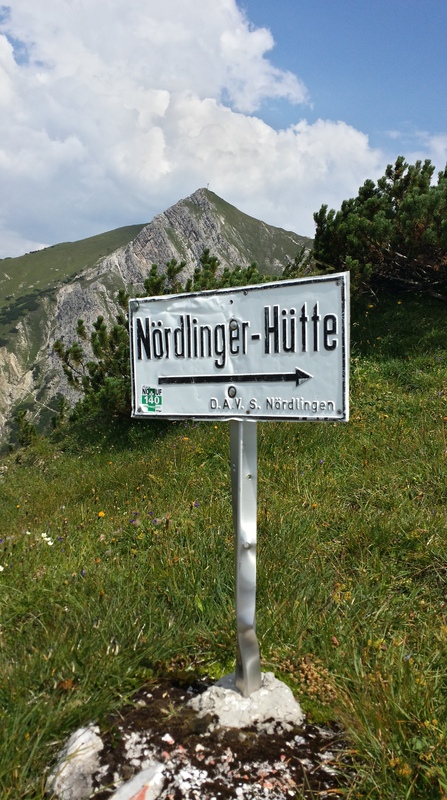 The Nördlinger Hütte is open from June until October. It closes down in the winter because it’s completely covered with snow! The cabin also has rooms you can rent out, some shared rooms and some private rooms, the prices are very reasonable between eight and twenty Euro a night! The cabin is very sustainable and has no electricity and they use rain water for the toilets, washrooms and even to wash the dishes! They have fresh water available but the tanks are filled up once in early June so they need to conserve what they can, if the water runs out it has to be refilled with a helicopter! The staff is incredibly friendly and speak many languages. If you ever find yourself in Tyrol, I recommend visiting this cabin! Thanks for viewing my post. 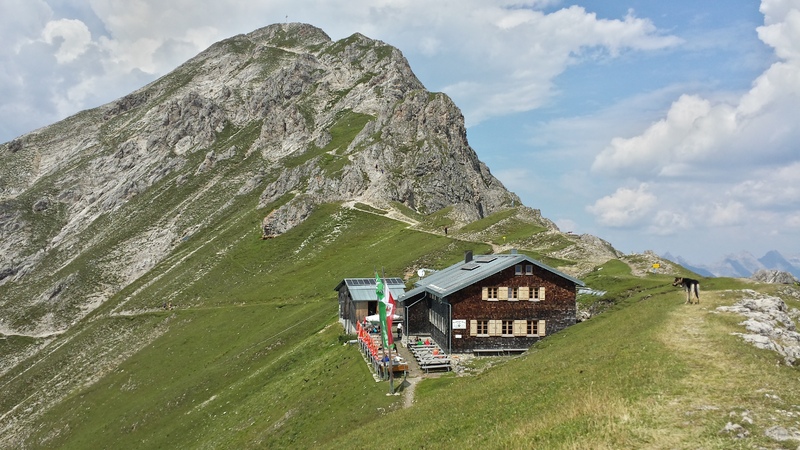 Just returned from the hut to hut tour of the Stubai – recommended. Its getting easier to eat vegetarian in Austria. Enjoy your time and studies there. Is that the Stubaier Hoehenweg? I have been meaning to go there but I heard it can take over a week! Maybe I should just pick out the most scenic part and do that. If you haven’t been there already I would also suggest the Drei-Seen tour in Kühtai! 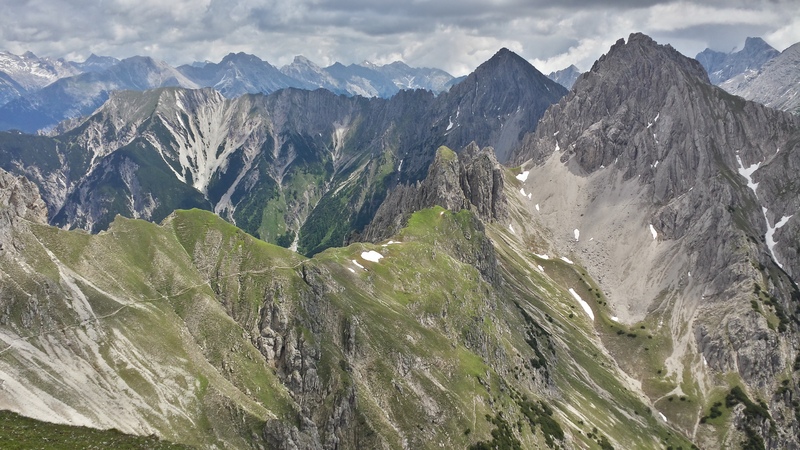 No matter where you go in Austria there will always be käsespätzle and kaiserschmarrn! 🙂 There is a great vegetarian place in Innsbruck, Chez Nico, also the Breakfast Club. Yes the Stubaier Hoehenweg, it does take over a week but can be shortened and made easier with the lift systems into the valleys. As we did. Huts will be closing now for winter.